Home / Celebrities / Aishwarya Rai slims down but we are STILL obsessed by her weight! Aishwarya Rai slims down but we are STILL obsessed by her weight! International celeb and UNAIDS goodwill ambassador Aishwarya Rai Bachchan seems to have hit her slim-down stride and has been look fit and gorgeous and glowy at recent events. And yet, we continue to have problems with her weight – this time of the ‘Oh my God! She must have gone on a starvation diet and/or killed it with the personal trainer’ kind. Uh, excuse me for being confused but ISN’T THIS EXACTLY WHAT THE WORLD HAS BEEN HARPING ON FOR A YEAR NOW? Pardon the all-caps but it’s just so frustrating to see this continuous outrage about Aish’s weight from people who shouldn’t even have an opinion. Because after all, whether a new mom (or any woman) chooses to be thin, fat or bald for that matter… HOW IN THE WORLD DOES IT MATTER TO ANYONE BESIDES HER AND HER FAMILY? 1. 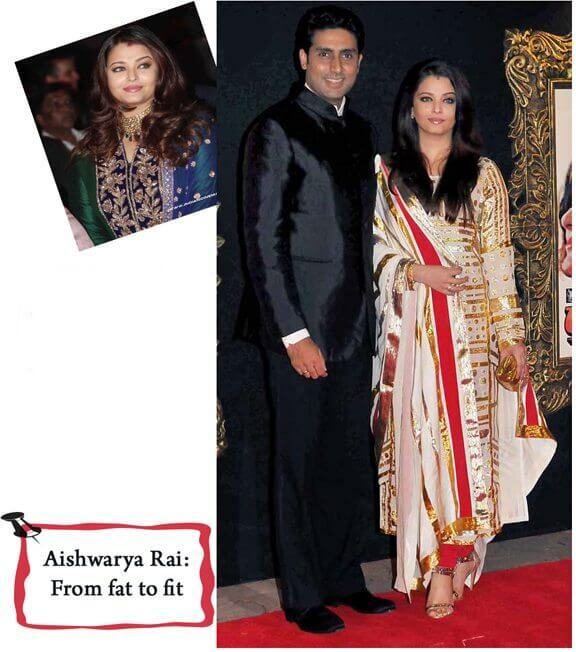 Yes, Aishwarya was overweight for much of the last year. Heck! Let’s stop being diplomatic and say she was actually F.A.T. She was also a new mom, who was clearly trying to be a mom and spend time with her child instead of handing her over to nannies while she waltzed off to gym sessions. 2. Add to this the normal stresses and vagrancies of motherhood – exhaustion, fatigue, time constraints, mood swings etc etc etc – and you can imagine that bouncing back immediately is totally unrealistic. 3. According to medical science, you should not be exercising for 6-8 weeks after delivery and then not aim for more than half a kg loss per week. If a woman does not take proper rest and nutrition at this stage, she is setting herself up for lifelong back problems, chronic weakness and a myriad other diseases. 4. Now that almost a year is up since Aradhya’s birth, Aishwarya is obviously working on dropping the pounds in a healthy and rational manner. We have gradually seen her go down the size charts for the past few months, so no – I really can’t see where everyone thinks its been done overnight or through magic pills, crazy diets and unreasonable exercise schedules. 5. As for the rumours about all the recently “thin” pix, I can tell you as a glossy magazine editor of 15+ years, while you can do it in photo shoots and ads (not really good but every single celeb and brand is doing it across the world), event photos normally don’t lie. Especially when they are distributed across numerous channels on which nobody has control. So, what you see is what you get. 6. Also, a quick reminder that Photoshopping works both ways. I have seen Aish many-a-times post-delivery and while she was “big”, she was never as humungous as some of the media made her appear. Horizontal photo-stretching anyone? 7. And anyway, if after years and years of maintaining a gorgeous figure – which in all probability meant rigorous portion control and daily exercise sessions – she did let herself go for a while and chilled out a bit, I would say good for her! Uh oh, and before this leads to another round of rumours, Aishwarya Rai Bachchan is not bald. She is also not going bald. And neither is she planning on being bald. That was just a manner of speaking. Now, if we could just keep her away from the all-fashion-sense-destroying disaster of Cannes for a couple of years, the world would be good again! Wouldn’t it? « The spy with the golden fingers! v true & v beautifully written. woah!!!! wot a change!!!! i have been tryin 2 lose ma weight since 3 months but…….anyways she is amzing!!! !